Schadow1 Expeditions released stunning and highly functional offline GPS navigation map for the Philippines upon the arrival of the new year for its advocacy on assuring that a Filipino would not be a stranger to his own motherland. With these maps, you would never get lost in the Philippines. 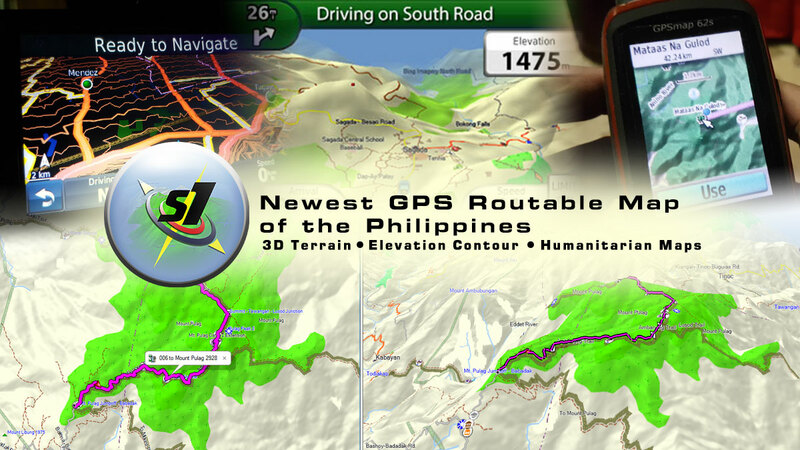 With enormous accuracy and functional elevation details for road trips and hiking, the offline GPS map for the Philippines has never been this accurate. We have currently released a whole set of new maps for the Philippines that you can load to your compatible Garmin GPS navigation devices. And if you do not have a Garmin device, you can easily use the mapping data for planning your trips and adventure; assuring well-planned itineraries, including planning of routes and an option to estimate gasoline consumption due to terrain information. 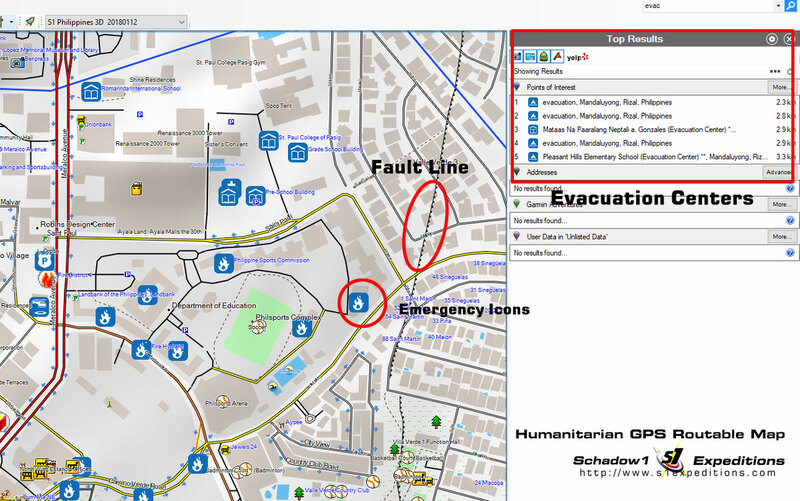 Additionally, we have also released optimized maps for humanitarian missions that can tremendously assist humanitarian operations such as relief and rescue for strategic response during disasters. On January 1, 2018, we have released the newest Offline 3D Terrain GPS Navigation Map of the Philippines. 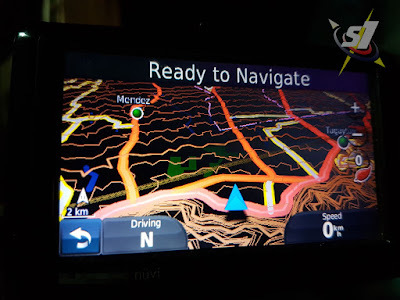 Aesthetically, it features a stunning view of the vehicle's GPS navigation dashboard of the route you are driving to, as mountains and hills - as well as ravines, are rendered accurately on your display. 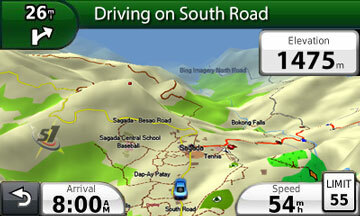 Functionally, it offers a new way of planning trips and navigating through "3D routing". 3D routing allows you calculate not only the flat distances of your route, but the more accurate slope distance - to where altitude of the roads you would ply to is calculated. This is possible with devices that are compatible with 3D Terrain™. On compatible devices, it can also give a more accurate calculation of gasoline consumption as the drag due to inclined roads are calculated. For hikers, using Hillshading™ compatible GPS handhelds, the newest 3D Terrain map from Schadow1 Expeditions enables them to visualize the difficulty of the path on screen as slopes are highly visible. With compatible GPS handhelds, slope distance is also calculated on-the-fly; allowing hikers and mountaineers to get a preview of the hike's difficulty right at your GPS handheld. No need for applications that is only compatible with desktop computers. 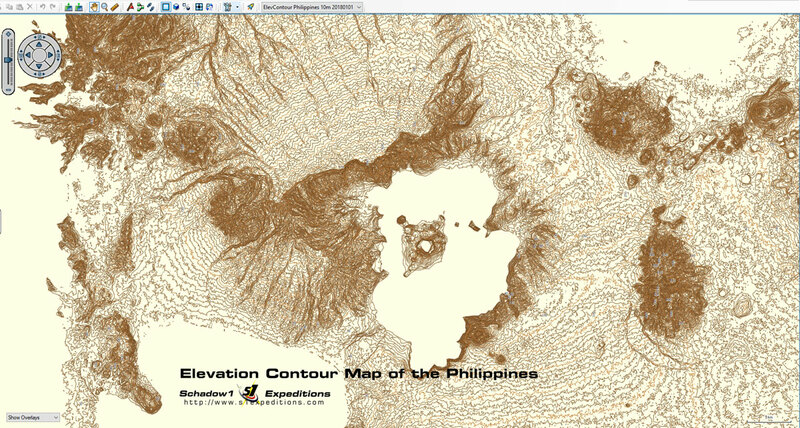 Adding up the Schadow1 Expeditions Elevation Contour Map of the Philippines with the 3D Terrain map in your handhelds provides additional information right on-screen by showing altitude lines of the surroundings and its corresponding altitude value. The 3D Terrain Map also utilizes the proven and more accurate GPS routable map of the Philippines, which is so far, the most accurate GPS navigation map of the country. With more establishments, bike routes and hiking trails, getting lost is a thing of the past. Using the 3D Terrain GPS Navigation Map plus the Elevation contour map enables a safe and strategical exploration; allowing you more time to enjoy adventures minus getting lost. Transform ordeals to adventure and excitement! The 3D Terrain GPS Navigation Map of the Philippines is version 4 of Schadow1 Expeditions' GPS map of the Philippines. The most accurate GPS routable map of the Philippines has been updated to its major version in September, adding more functionalities and features from its previous version. Cliff edges and power lines are now optimally visible for a safe hike. Elevation of mountain peaks are now also visible in the map. For drivers, open hours of village gates are indicated. Establishments open hours and contact number are visible upon search. Previous features such as highly visible roads, an indicator for regularly-used hiking trails with one of the largest amount of data is still included on version 3 of the GPS routable map from Schadow1 Expeditions. The mapping data is based from over 2.5 million mapping data produced by our expeditions, as well as contributions from OpenStreetMap volunteers. The elevation contour map can also be added with this map as an optional layer for elevation lines information. The GPS routable map of Philippines functionality is available in its standard form (for those devices incompatible with 3D Terrain™ and Hillshading) and is also integrated into the newest 3D Terrain navigation map as version 4. Schadow1 Expeditions fully supports humanitarian missions in the Philippines and has been working on GPS maps for rescue and relief operatives since 2013 during the Haiyan (Yolanda) crisis. Our maps provide directions for humanitarian operations before, during or after a disaster by enabling frequent updates during humanitarian activations. This capacitates operatives with fresh data on buildings and road damages for reroutes and detours as well as strategic planning for humanitarian response. Our maps have been proven to be a vital partner in missions, giving humanitarian teams a birds-eye-view during disasters when most people on the ground are crippled or incapable during calamities. Incorporating most recent and real-time mapping data from mapping activations by advocates and volunteers during disasters, rescue operations are fed with latest data for appropriate response in calamity-stricken areas. 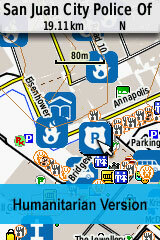 Version 3 of the map includes highly visible humanitarian and emergency-related icons by the United Nations Office for Coordination of Humanitarian Affairs (UNOCHA) for familiarity due to international standard symbols. 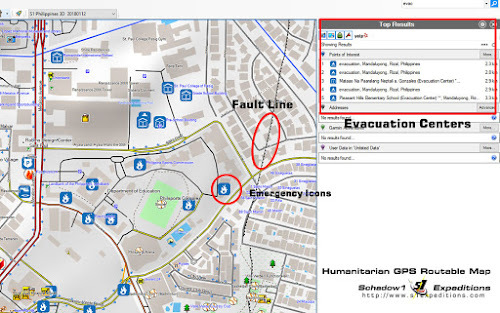 Evacuation centers, emergency assembly points, hospitals, and clinics, emergency airdrop locations and helicopter landing sites, police stations, fire department and fire hydrants, as well as community centers, are visible and searchable. The latest update also includes the Valley Fault System for strategic routing and planning in case of the "Big one". The elevation contour map is an available add-on for the standard GPS routable maps and the 3D Terrain map to provide a topographical map overlay. 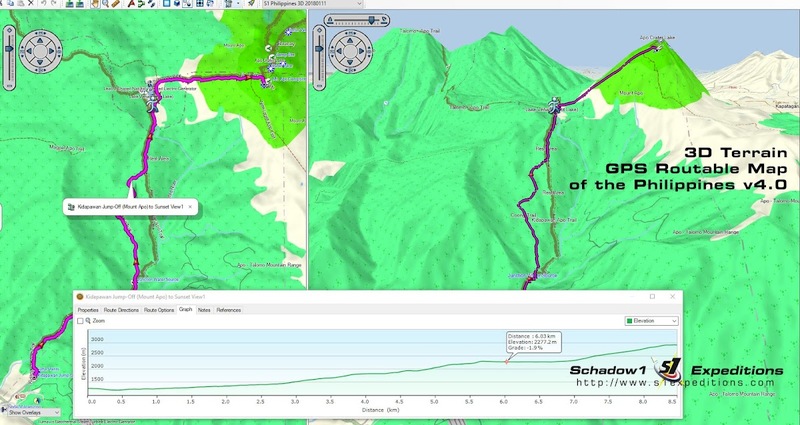 This map provides values of elevation lines in 10-meter step at 30-meter accuracy right on the screen for immediate information needed by hikers, bikers and off-roaders. The difference of this add-on from the 3D Terrain map is that this provides visual elevation data while the 3D Terrain map provides 3D visualization of topography as well as calculations for slope routing. The Elevation contour map of the Philippines has been updated to version 2 to include the more accurate 1 arc-second data accuracy from NASA's SRTM mission and improved visibility on day and night modes. This add-on is for legacy Garmin GPS devices that need a separate application for giving alerts when approaching or exceeding speed limits on major roads in the Philippines. It has been recently updated to include newest exits in TPLEX. The maps are available through a donation to ensure that we can continue our mapping expeditions, map improvements, and server costs in hosting and developing the most accurate GPS map for the Philippines. We also provide a free version of the GPS routable map of the Philippines based on version 1 of our GPS map as part of our advocacy. We update our maps weekly to ensure that you get the latest mapping data from our expeditions and from mapping volunteers. Below is the log of the latest update of our maps. For more information on our maps and to donate, visit our download page.